16x2 LCDs are most commonly used display units in microcontroller based projects. I got much information about LCD, LCD commands, LCD initialization etc from the below link and I hope, it will be very much helpful for beginners. The above code is for AVR microcontroller. I am usign avr-gcc in linux. Now we get a.hex file. power the LCD module. But we can directly connect the port bits of MSP430 to LCD..
Never forget to provide a connection between both the grounds of launchpad and external supply. 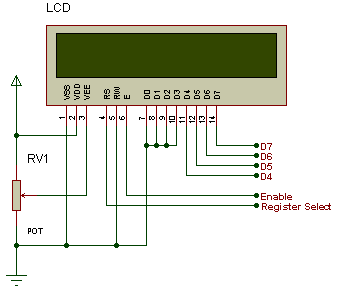 Pull down the VEE of LCD with a 1K resistor or use a POT ..
Use a 470 ohm resistor to provide the supply for the backlight LED..
*MSP430 launchpad based 4bit lcd code..
*Assuming the clock is 1MHz..
*Otherwise use any delay routines, if available. Here is a working code for stellaris launchpad. could you please the the wire connrctions between LCD and msp?? thank you very for replying...valare nanniunde..I have connected according to the circuit only...but still it has not worked successfully. 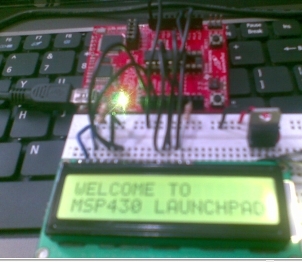 I am using MSP430g2231 and the Code Composer Studio v4. Should i make any special step while executing the code?? I have done like this: First connected the circuit according to the circuit diagram,then connected the device to SYSTEM.Opened CCS,new proj,source.c,included mp430g2231 files,written prog,debugged n have given run...but instead of LCD, leds present in MSP device glown. Could ypu please reply ofr the above mentioned issue?? One more problem is some current from System is going to LCD.How to solve this issue??? In your case if it is compiling correctly and not working while running the code, then I think the problem is the Watchdog timer resetting the mcu. add this line inside main, just as a first line in main function. Now compile it and inform me if it is having the same problem. what do you mean by "some current from system is going to LCD"? ......in the 96th line,still it is not working. Should i take that txd,rxd jumpers out?? I took out jumpers at p1.0& p1.6. I will give u a hex code. So we can decide if it is a hardware problem or software problem. What should i do with hex code?Should i paste the hex code in CCS and run?? pls help me with the hex code.. we have tried our lcd JHD162 with 89s51 n it displayed. Could you please reply for the above issue? I have a problem.. Im using pic18f2550 and Mplabx C.. I tried everything for 4 bit LCD..still I couldnt run it..what should I do? hi, i ran it in the version v8.60. but LCD gives no output. But why help me..!! with following conditions, is it possible.?? What change do I need..?? I m using PIC 16F877a with Hi-tech compiler. I have done with serial communication and 4-bit LCD display program individually. Now i want to merge these 2 to display serially received data.Till now i can receive correct data serially but LCD displaying wrong characters. so tell me how i find the exact problem and how to solve it. can anyone provide me the code for lcd display 4 bit mode in pic 16f72. pls send me the code. Hi, it such a great info for beginner like me, but what does 4 bit interfacing means?? All in One - LCD interfacing with all MCU's. All in One place - really nice. Please provide a circuit diagram for the PIC16f877 project because mine ain't working. while i am trying to build it showing this are all __ undefined symbol. Anyone has sample code for 16x2 LCD interface on launchpad with MSP430F5529? If so please provide me a copy..